The number of new houses beginning construction fell in January, but future construction permits increased by 4.6%—higher than any time since November 2015.16http://www.cnbc.com/2017/02/16/us-housing-starts-jan-2017.html Housing Starts are also up 10.5% over January 2016.17http://www.cnbc.com/2017/02/16/us-housing-starts-jan-2017.html While the most recent report shows a monthly dip, the data indicates that housing has grown over the past year and will continue to grow in the future. Learn to perfect searing this succulent seafood. Remove the small side muscle from each scallop. Rinse scallops with cold water and pat each one dry completely. Heat a 12- to 14-inch sauté pan on high. Add butter and oil to the pan. Salt and pepper the dry scallops. Watch for the butter and oil to begin slightly smoking before adding the scallops. Place the scallops in the pan so that they do not touch one another. Sear scallops for 1 1/2 minutes on each side. 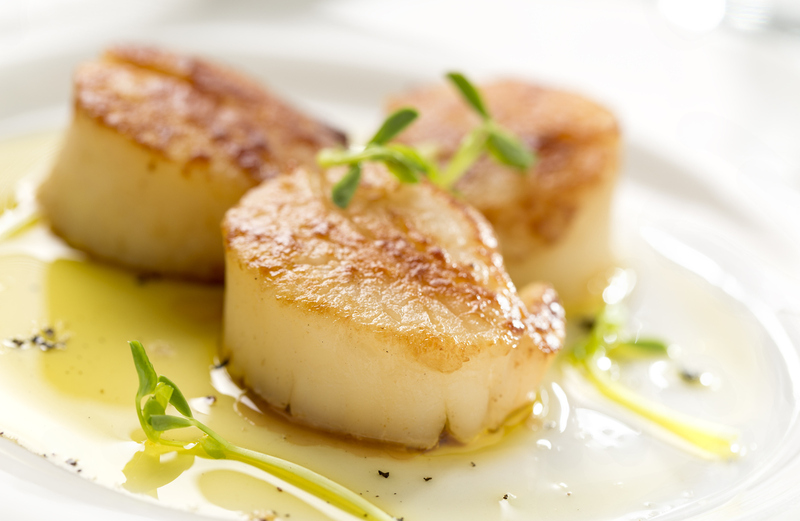 Be sure the top of each scallop has a 1/4-inch golden crust and the center is translucent. Taking Social Security benefits is an essential income strategy for many retirees. If you are receiving these benefits, you may have to pay federal income tax on some of your payments. Follow these tips and reminders to help understand and uphold your tax responsibilities. Receive Form SSA-1099: To start, you should receive Form SSA-1099, Social Security Benefit Statement, if you took any Social Security benefits in 2016. This form shows your benefit amounts. Identify income sources: If your only income in 2016 came from Social Security, you may have a couple of filing benefits: 1) Your Social Security income may not be taxable, and 2) you also may not have to file a federal income tax return. If you have other sources of income, however, you may need to pay taxes on some of your Social Security distributions. Identify the full amount of your income, including tax-exempt interest, that does not include Social Security. Calculate half of the total amount you received in Social Security. Add one half of your Social Security income to your other income. Compare that total to the base amount of your filing status. If the total you calculate in Step 4 is more than your base amount, you may have to pay taxes on some of your Social Security benefits. Just like any sport, golfing has its own etiquette that athletes should follow in order to maintain a respectful, engaging game. While some traditions are nearly as old as the game itself, modern standards have also emerged for us to follow. Here are some reminders on common courtesy we should all be aware of when on the course. Smoking a high-quality cigar (and sharing!) while playing is acceptable behavior, especially when everyone in your group is okay with the smoke. What’s not acceptable is littering your butts and other items. So pick up your trash and keep the course clean. If you see that someone you’re playing with could use some tips, we encourage you to fight the urge to teach them. Reserve your guidance for the range, not mid-round where everyone is here to play, not practice. Plus, if you offer unsolicited help, you may just end up offending your playing partner, which is a recipe for a bad day of golf. Having a strong metabolic rate is important for staying healthy. How efficiently your body burns calories will drive many health factors, such as how easily you stay trim. While aspects of our metabolisms are genetic, you can still take steps to boost yours. To optimize your health and improve your metabolism, follow these tips. Your body is always burning calories, even when resting. On average, you will burn roughly six calories each day for every pound of muscle; meanwhile, you burn only two calories daily for each pound of fat. When you have stronger muscles, you increase your resting metabolic rate. You need water to burn calories. And drinking more water can help you burn more calories. In fact, when you are dehydrated, your metabolic rate may even decrease. To ramp up your metabolism, increase the amount of water you drink throughout the day, especially before meals. Also, make sure to swap chips and salty snacks for fruits and vegetables, which naturally contain water. Hot foods, such as green chili peppers, naturally boost your metabolism with natural chemical properties. While the effect may be temporary if you sporadically eat spicy food, with prolonged, consistent consumption, you may see these benefits add up. To incorporate more spice into your diet, you can easily add fresh chili peppers or red pepper flakes to dishes like soups and pasta. Lower your carbon footprint: Craft breweries rarely have large distributions that cover thousands of miles across the country. Instead, they tend to focus on smaller distributions within their local radius. By either buying their bottles, filling your growlers, or drinking on site, you are contributing to less distribution needs from commercial producers and helping to lower your carbon footprint. Support your local economy: Your local brewer lives in your very own city and community. By drinking their beer at their establishments, you are putting your own dollars to work by supporting your local economy. Minimize your beer waste: Another benefit from drinking local beer is that you can ditch the bottles and cans for growlers. A growler is typically a 4+-pint container that you can fill with beer onsite at the brewery (or at growler-filling shops, if your community has them). By filling, drinking from, and reusing them, you cut your personal waste down to zero. If craft beer isn’t your preference, you can always support your community by drinking locally made wine, ciders, and other spirits.